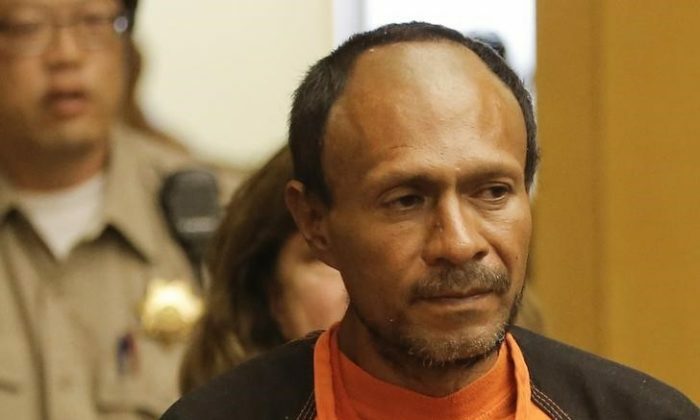 The trial of a Mexican man accused of murdering a woman while illegally in the United States began in San Francisco on Monday–a case that President Donald Trump has cited as an example of the dangers posed by lax border security. Juan Francisco Lopez-Sanchez, also known as Jose Ines Garcia Zarate, has said he shot Kate Steinle by accident on a pier in the California city on July 1, 2015. He has pleaded not guilty to second-degree murder, a charge that can bring between 15 years to life in prison. Court officials confirmed the trial had started but did not offer further details of the proceedings. Assistant District Attorney Diana Garcia declined to comment on the case. Prosecutors have accused the defendant of recklessly pointing a stolen gun at people on the pier. Prosecutors and defense attorneys were in court and not immediately available for comment. Garcia Zarate had been deported to Mexico five times since first entering the U.S. as a juvenile, the San Francisco Chronicle and other local media reported. Steinle has been frequently invoked by name by Trump as part of his signature pledges to halt illegal immigration and crack down on so-called “sanctuary cities” that refuse to comply with certain federal immigration laws. In June, the U.S. House of Representatives voted 228-195 to pass the “No Sanctuary for Criminals Act,” which would withhold some federal grants to sanctuary cities. By a vote of 257-167, the chamber also passed “Kate’s law,” named for Kate Steinle, to increase penalties for illegal immigrants who return to the U.S. Under the laws, immigrants in the country illegally would face mandatory detention for past convictions of an expanded number of offenses. San Francisco, like other sanctuary jurisdictions, has defended its approach as making the city safer, saying its practice of not inquiring about immigration status makes immigrants, including those in the country illegally, more willing to report crimes.